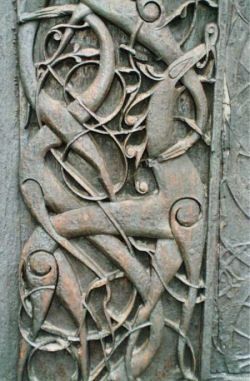 The Urnes style is the last phase of Viking art. It takes its name from the remarkable carved wooden doors of the stave church at Urnes, Norway. The style is a refinement if the Ringerike style and depends upon interplay of gracefully curving lines for its effect. The animals are still curvaceous and one or more snakes are included with the quadrupeds. The spiral hip is still used, but it is not as large as in the Mammen and Ringerike styles. The animals have large almond-shaped eyes and often bite one another. The Urnes style was often used on runic stones, when the runic inscription was carried within the body of the animal. A fine example from Lingsberg, Uppland, Sweden, has a Christian cross and two Urnes style animals which carry the runic inscription.